Manda Krishna Madiga wants action against those who transported the statue in a garbage vehicle. 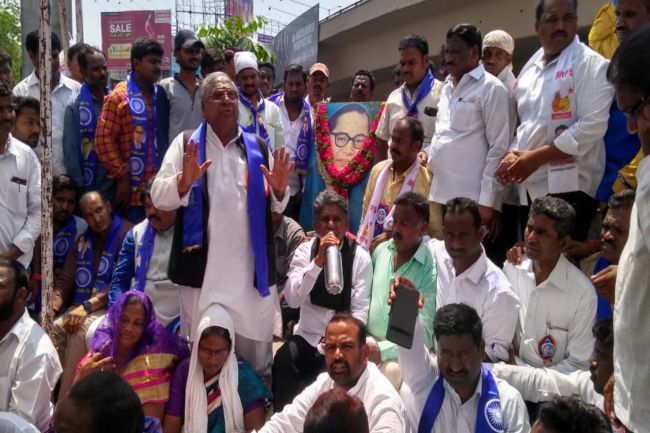 Giving an ultimatum of 24 hours to the Greater Hyderabad Municipal Corporation to restore the statue of BR Ambedkar, Dalit leader Manda Krishna Madiga on Sunday threatened to launch a protest if the government does not meet their demand. On the eve of Amdedkar Jayanti, the GHMC had removed the 10 feet statue of Ambedkar from Punjagutta circle in Hyderabad -- newly erected by Ambedkar Statue Protection Committee-- on grounds that it did not have a valid permission. Initially, the statue was taken to Kotla Vijaya Bhaskar stadium in Yousufguda, but later transported in a garbage truck and thrown at a dumping yard. The insensitivity and over-enthusiasm displayed by the authorities triggered strong protests from Dalit organizations who alleged humiliation of the Dalit community. The images of the broken statue were shared widely. Following a call for ‘Chalo Punjagutta’ protest, several activists had gathered at the spot of the statue and demanded the authorities responsible for the ‘atrocious act’ be punished under the Prevention of SC/ST Atrocities Act. Pointing out the double-standards of the authorities, he said that the authorities did not touch the statue of late united AP chief minister YS Rajasekhar Reddy which also didn’t have a permission but only removed the statue of Dr BR Ambedkar. Manda Krishna Madiga also alleged that the incident reflected the ‘anti-Dalit’ stance of the TRS-led government. Other political leaders who joined the protest include Congress leaders V Hanumantha Rao, former MP and Ramulu Naik, former MLC. “The removal of the statue in such an atrocious manner only betrays the upper-caste mindset of the government,” said Hanumantha Rao. Naik also questioned KCR's promise to erect a 125 feet Ambedkar statue. “What happened to your promise? Where is the statue?” he questioned. Meanwhile, the GHMC has initiated a probe into the incident. GHMC Commissioner Dana Kishore has already suspended the Yousufguda yard operator Balaji for throwing away the statue at a dumping yard in Jawahar Nagar without taking instructions from superior officials. The Jawahar Nagar police registered has also registered a case under SC/ST (Prevention of Atrocities) Act and Section 427 of the IPC based on complaint by P Ramurthy, state president of Telangana Mala Mahanadu.